Many defense experts express alarm at the new generation of supersonic anti-ship missiles, like the Russian Sunburn. However, high speed degrades missile targeting since a supersonic missile has just seconds to identify a ship target. In addition, a missile with small stub wings can barely turn at Mach. Rear thrusters can be used, like those used by American TOW missiles and larger National Missile Defense interceptors. Nevertheless, the incoming missile needs to be nearly on target before its sensors adjust course to achieve impact. Another factor is that these complex missiles cost a million dollars each and 10% malfunction. Finally, sophisticated decoy systems can be employed to confuse missile sensors, perhaps causing a missile already on target to veer off. One solution is a Supersonic 8-path "Super 8" anti-ship missile. This would be a simple near supersonic missile with a jet engine and no warhead or sensor. It could be the same size of a Tomahawk missile (right), but replace the 1000 lb high-explosive warhead with more fuel, allowing much greater range. A Super 8 would be much less expensive than sensor-guided Tomahawks as they have no sensor or warhead, they are just a rogue engine flying about causing panic and occasionally colliding with a ship. In 2013, a slow flying target drone crashed into a US Navy cruiser causing serious damage. A Super 8 would fly to a target fleet area after launch from a bomber, fighter, or ship just ten feet off the ocean surface at around 600 mph. After passing though the target area, it would make a wide turn and then accelerate through the target area again at top speed, then loop around again for another high-speed pass. It would fly these eight-tracks until it runs out of fuel and falls into the ocean. Ideally, it would slam into a ship, causing damage and starting fires as its remaining fuel ignites. Keep in mind that a jet engine is a dense object that will cause much damage at near supersonic impact, and a Super-8 will carry a tungsten penetrator rod to punch deep inside a ship and set fire to whatever it encounters. Some Super 8s may also perform reconnaissance by carrying a video camera to broadcast what they find. Ship defenses could not blind or confuse a dumb Super 8 as it flies a preprogrammed 8-path. Even if a Super 8 does not hit a ship, it would cause much panic and confusion as it weaves through a fleet formation, probably causing friendly fire damage among the ships and its fighter aircraft. In addition, ships may exhaust their stores of decoys and defensive munitions attempting to destroy these high-speed interlopers. 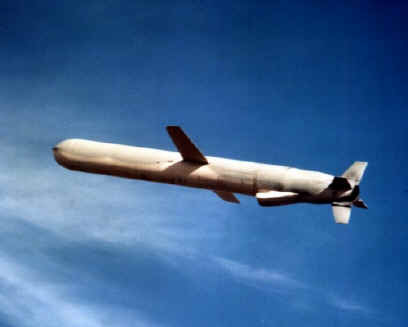 As a result, dozens of simple Super 8s should be launched against a fleet to arrive just prior to the more sophisticated and expensive anti-ship missiles using sensor guidance. Fleet defenses may be exhausted and confused engaging the Super 8s attacking from all directions and unable to focus on the follow-on deadly sensor guided missiles. Dumb Super 8 missiles would cause much chaos among a fleet, especially if a few slam into ships.